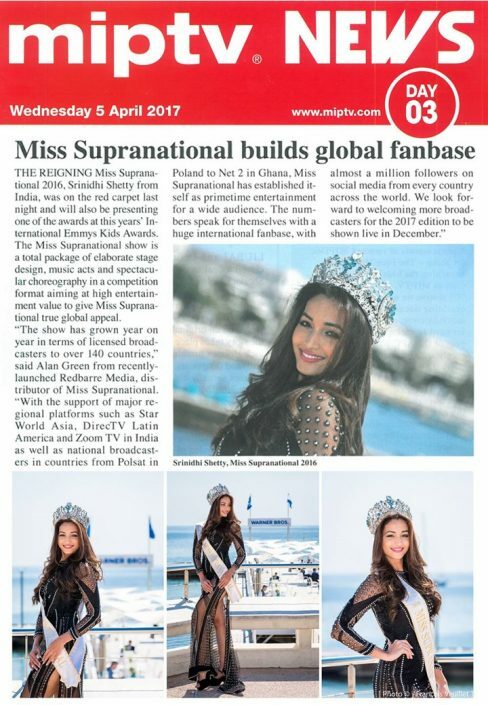 The organization of Miss Supranational is delighted to report on the amazing visit by Srinidhi Shetty, Miss Supranational 2016, to Cannes in France to attend MIPTV, the world’s foremost TV and digital content market. With TV and media executives from over 100 countries as well as actors and celebrities, this was the place to be be seen and finding out the future direction and trends in the broadcast media industry. During the 4 day event, Srinidhi was invited to attend the key red carpet events and photo calls. On the first day, Srinidhi met with the international photographers from press outlets around the world including key media such as Associated Press, Getty Images and Reuters, for a fantastic photo shoot on the iconic Promenade de la Croisette against the background of the blue Mediterranean Sea. Srinidhi wore a beautiful gown by Designers Falguni and Shane Peacock. Within hours Srinidhi was whisked back to her hotel to prepare for the prestigious Opening Night Red Carpet held at the famous Martinez Hotel, where she made a huge impression and shared the limelight with international actors and celebrities such as Oscar Nominee Jeremy Renner (Arrival, Mission Impossible, Ther Avengers), American Actress Julia Stiles (The Bourne Identity), Swedish Oscar Nominee Lena Olin, Japanese Star Hidetoshi Nishijima, German Actress Rike Schmid, Russian Actor Kirill Karo, US Reality Star Brooke Hogan (Daughter of Hulk Hogan) just to name a few. The following day Srinidhi prepared for the presentation duties at the International Emmy® Kids Awards. These are the only Emmy Awards from the International Academy for Television Arts and Sciences that are held outside the USA. 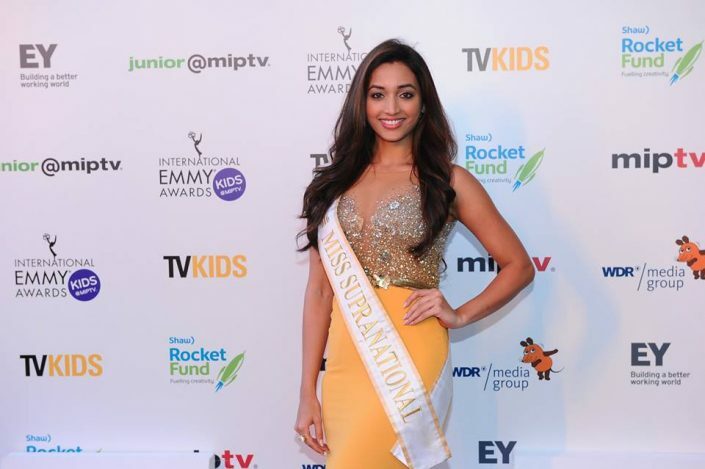 On the distinctive Purple Carpet Srinidhi made an impact with a beautiful gown from Designer RS by Rippii Sethi. 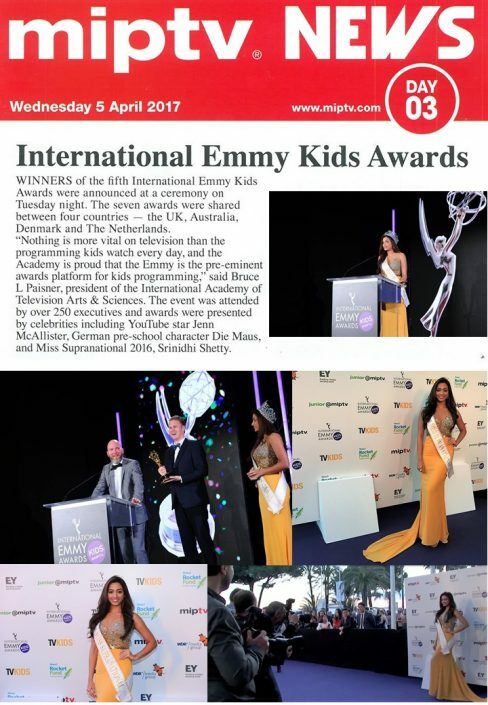 Srinidhi presented the Emmy award for Best Non-Scripted Entertainment Show to ’Baking in The Dark‘ from Denmark. Day 3 saw Srinidhi meeting Broadcasters from all over the world in the Palais des Festivals before getting ready for the Gala Dinner for the Industry’s Medaille D’Honneur (Medal of Honor) Awards, this year presented to Germany’s ZDF, China’s Huace TV, Russia‘s CTC Media and Amazon. 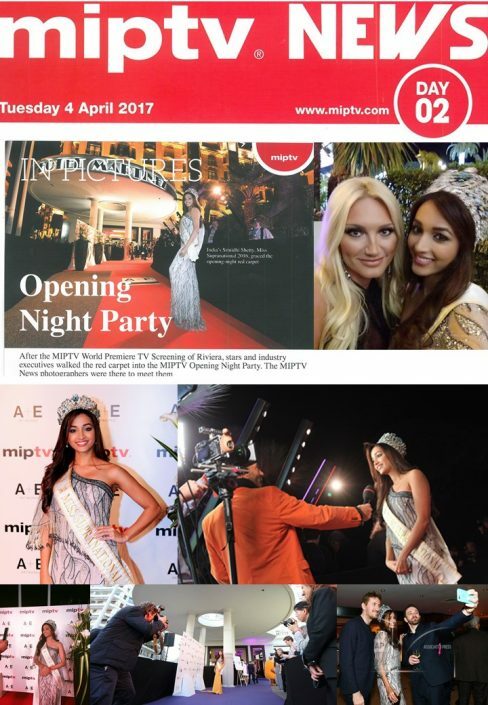 The tremendous growth of the televised pageant on the international sedia stage was reflected by the interest in the format at MIPTV. Our US distribution company, Redbarre Media, informed us of new countries and broadcasters expressing interest in licensing the show for 2017 and joining the Supranational Family. Miss Supranational certainly created a buzz this year amongst the attendees and we look forward to working with more partners on the global stage.